The Border Guard Bangladesh (BGB) intercepted 34 boats carrying at least 340 Rohingyas at border and pushed them back to Myanmar/Burma, according to BGB officials. “They were pushed back from Fuler Dale, Jadimura and Kanjormarha points of Naf River (on the border between Bangladesh and Myanmar) to Myanmar on December 25 morning,” said Teknaf-based BGB Battalion’s Major Abu Russel Siddiqui. 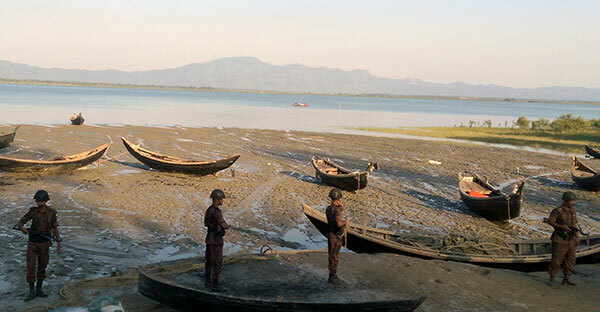 The boats tried to intrude into Bangladesh, but, BGB patrols compelled them to go back to Myanmar. Each of the boat carried around 10 people,” he said. However, dodging the ‘strict vigilance’ by BGB, many of the persecuted community have already managed to sneak in to Bangladesh and taken shelter. Major Russel claimed that more than 459- boat carrying Rohingyas have been turned back since December 1, 2016. Bangladesh is under considerable pressure to accept the Rohingyas on humanitarian grounds. Many of those arriving Rohingya migrants are, in extremely poor health and in need of medical attention. Several people have crossed the border bearing untreated bullet wounds. But, did not seek medical attention from the few clinics in the area, out of fear of being detained and deported, according to reliable sources said. “The Bangladeshi government must not add to the suffering of Rohingya. They should be recognized and protected as refugees fleeing persecution, not punished for who they are,” said Champa Patel. But Dhaka says that the Rohingya problem should be settled by international pressure on Myanmar and Bangladesh, as an over-populated country, has no space for huge numbers of migrants from across the border. This entry was posted in English, News and tagged Arakan, BGB, pushed back, Rakhine, Rohingya, Teknaf. Bookmark the permalink.